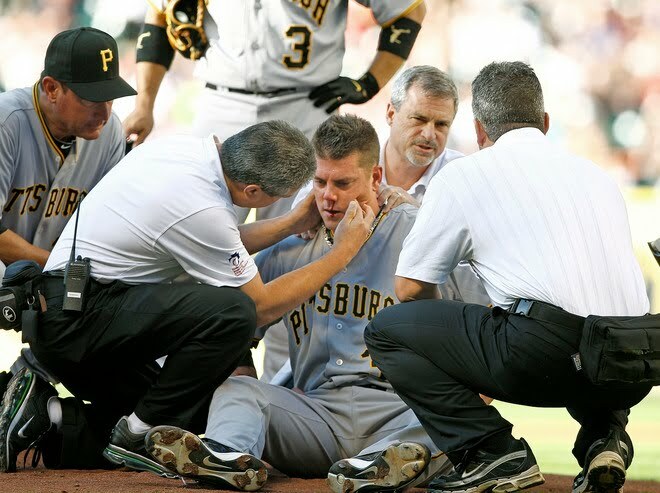 Starting pitcher Chris Jakubauskas was hit in the head by a Lance Berkman line drive in the bottom of the first inning, adding injury to insult in yet another loss for the offensively-challenged Pittsburgh Pirates. In their latest defeat, the Pirates managed just five hits in a 5-2 loss in Houston on Saturday night. The only good news of the night is that the CAT scan and x-rays were negative on Jakubauskas, per Rob Biertempfel of the Trib. The 7-10 Pirates have now lost their last five games by a combined score of 45-6; their hit totals in those games were 6, 4, 8, 4, and 5. Regardless of their league-worst pitching and team ERA of 7.07, it's hard to win many games scoring one run a night. As a team, they are hitting a lowly .225, which somehow is only 28th in the 30-team league. Saturday night's lineup featured more of the ineptitude that we've become accustomed to. The 3/4/5 of Andrew McCutchen, Garrett Jones and Lastings Milledge was a combined 1-for-11 with four strikeouts. The only batter with any significant contribution was Jason Jaramillo, who hit a solo homer in the seventh. I could go on, but I think everyone gets the point. The dual 7-10 teams wrap the series on Sunday at 2:05, when Charlie Morton and his 16.55 ERA throw batting practice against Brett Myers (0-1, 4.05).